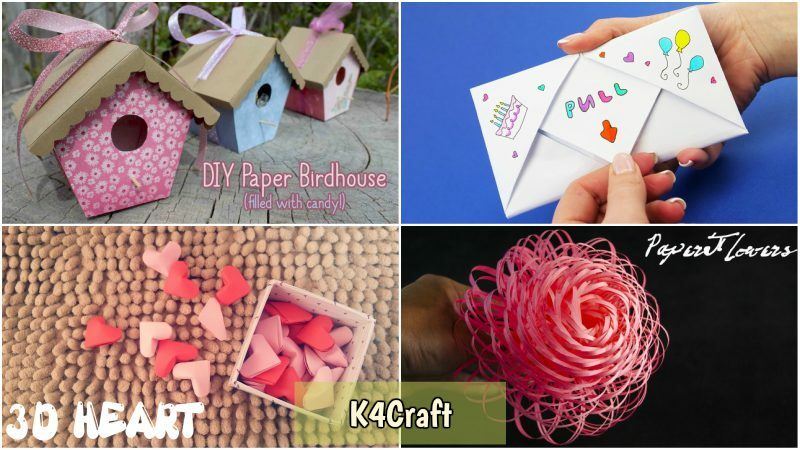 You can write on a paper, make crafts from a paper and many more things. But do you know that you can even make a box from a paper? Yes, you can even make paper boxes. You can even make these boxes from used papers. It would be like recycling them. So, just grab some papers, a bit of imagination and I can assure you that you would have a lot of fun. 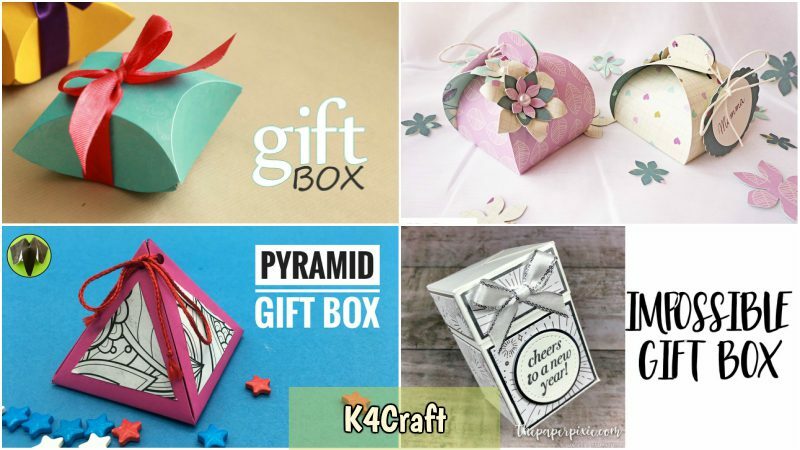 So, here I am going to tell you how to make some cute paper boxes. Let’s get started. This box is easy to make and you can use it to gift candies or even keep it for decoration. It looks really beautiful. For making this box you need red colour paper and green colour paper and a marker. First, cut out a big circle from the red paper and then fold it in half. Now, fold this semicircle in half and then again fold it in half. You would finally get a structure of a cone. Now, draw a part of the circle on the top and then cut it out. Punch holes in the paper. Do the detailing of the strawberry with a marker. Unfold it, you will get four heart shaped petals. For this box, you need only three, so cut out one of the petals. Take a green coloured string and pass it through one of the hole. Pass the string through all the holes from outside in and then finally pull both the strings together so that you will get the structure of the box. Cut out a small circle from the green paper and fold it the similar way you did for the strawberry. Now, instead of a circle, draw the shape of a cone on the paper and cut it out. Cut the tip of the cone, to make a hole. Unfold it and you would get a beautiful flower. 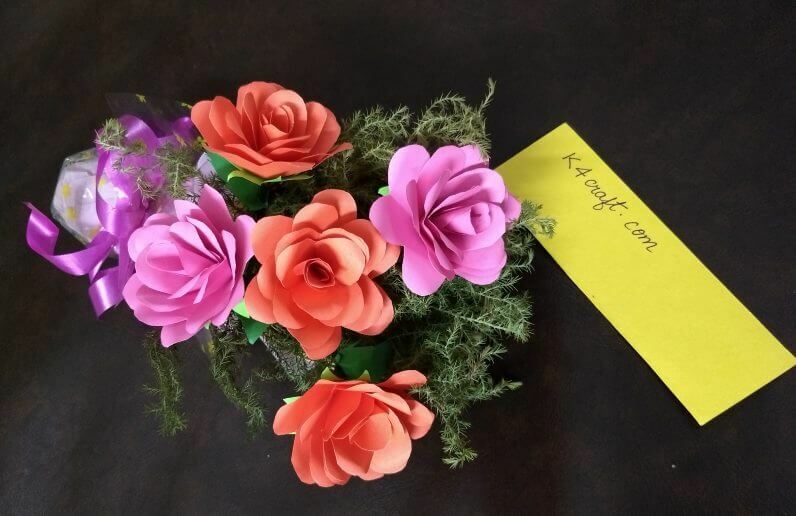 Now, pass the string from the box through the hole in the flower and tie it. Your strawberry box is ready. Watch the video for steps. For making this gift box, you just need a printed paper. First, fold the paper diagonally and then unfold it. Fold it diagonally from the other side and unfold it. You would get a ‘X’ sign. Now, fold the paper in half and then unfold it. Fold the paper from both sides so that the folds would touch the mid point of the creased marks. You would get a rectangular shape. Now, fold the paper in half and repeat the former step. Unfold the paper. You would see a small square in the paper created from the folds. Fold the paper diagonally from all the sides so that each diagonal fold would touch each corner of the square created. You would now get four small squares in each corner of the paper. Fold each diagonal so that they would touch the corner of the small square. You would get crease marks on each side. Fold the creased marks inwards and you get your gift box. Punch holes and pass a ribbon through it to assemble the box. You can gift it to someone or keep it with you. Here’s the video representation. These chalk boxes are really easy to make and look really cute. For making this box, you need to first print out the template which is given in the video below or you can simply draw the template. Trace the template on a thick printed paper and cut it out. You would get two slits and two flaps. Keep your gift inside and then join the two flaps and then secure it by inserting both the slits. Your chalk box is ready. Tie the box with a string. Decorate it with plastic flowers and beads. Watch the video below for the steps. The name is a bit weird right? Well, don’t worry it’s not impossible to make such box. The name is given so because when you pull the lid of this box, the whole box opens up. The process to make this box is a bit knotty but not impossible. You can easily make this at home. Along with papers you need to have the right measurements because this box is all about measurements. This box might take some time but the result is really beautiful. So grab your papers and scales for making this box. Watch the video below and follow the steps closely. For making a pyramid box take a square piece of colourful paper and mark 7 and 14 cm on each side. Now, join the lines based on the measurements on each side. In each middle square of a side, draw a triangle. Now, join the triangles by drawing lines from one edge of a triangle to another edge. You would get a big and a small triangle on each side. Cut out these triangles. Now, fold the sides of the paper which you have got after cutting out the triangles. You would still have the triangle which you have made first. After folding the edges, fold the triangles a bit so that it would be easy to assemble it to a box. Make holes on each triangle and pass a string through it and pull it. Your pyramid box is ready. Decorate the box as you want. Here’s the video tutorial. Making an explosion box is not that difficult. I am going to tell you the basic structure of how to make an explosion box and then you can add layers to it. You need a square piece of printed paper. Take equal measurements on each side the way you did in the previous project and then fold the paper according to the measurements. You would get mini squares. Fold the mini squares on the corners a bit inward. Make diagonals on the squares on the corners and cut it out. Now fold the corners like you did earlier and your box is ready. Similarly make the lid of the box from another paper. You can add more layers to the box. You can keep chocolates or you can add photos. Decorate the box with your creativity. Here’s the video representation. This one is named so because the box exactly looks like a pillow. For making this box you need colourful papers and rounder. Make a circle in the paper. Mark the radius and draw two lines so that the circle will get divided into four parts. Now, make another circle, whose one part should be that of the first circle. Make two lines the same way you did for the first circle. Remember, the lines should touch the part similar to both the circles. Now, draw semicircles in each part of the circles. Cut out and then fold the semicircles. Fold them properly to assemble the box. Your pillow box is ready. Tie a ribbon to make it look festive. Watch the video for steps. You can make this box for valentine’s day or for some other special occassion. It’s super easy to make and looks really adorable. 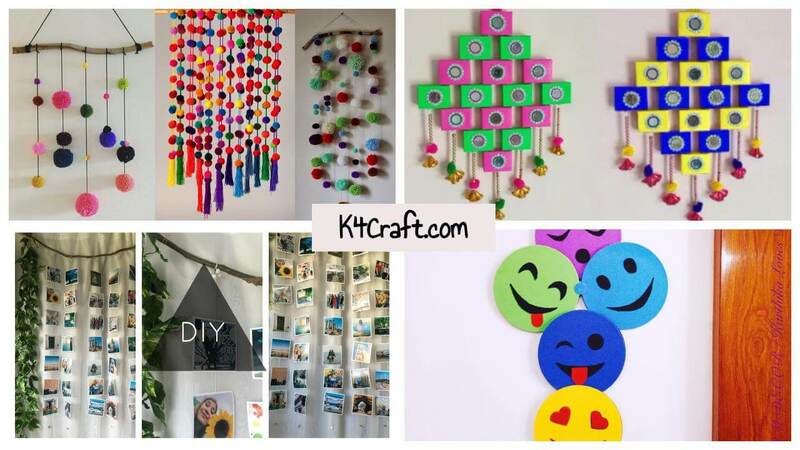 For making this you need colourful papers, scissors and glue. Cut out two hearts from two different colourful papers, one for the lid and one for the box. Cut out a long strip of colourful paper for the box, whose breadth should be according to the height you want for your box. Keep 2-3 cm extra. Now fold the extra measurement you have taken and then cut thin strips so that it should look like shredded paper. Apply glue on the shredded paper and stick it to the heart marked for the box. This would make it easy to fold the paper in the heart shape. For making the box look neat, cut out another piece of heart of the same colour of the box and stick it at the back so that the shredded paper can be hidden. With the same procedure make the lid, but instead of sticking the shredded paper on the outer side, stick it on the inner side. Your heart shaped box is ready. Watch the video for steps. So, these were some ideas on how to make paper boxes. Paper boxes are not only cut but are also biodegradable which means that they won’t harm the environment like the plastic does. Do try out these ideas at home.